We had spent the weekend with Jerome’s family and after an evening of food and laughter we were ready to explore the island. Réunion has many different microclimates with landscapes ranging from arid forests to tropical beaches. On our way to the Piton de la Fournaise volcano we reflected on how these different microclimates reminded us of a mixture of places across the globe. We even found the moon! Piton de la Fournaise is a shield volcano and is one of the world’s most active volcanoes. It is around 530,000 years old and 2,631m high. Piton de la Fournaise is one of two volcanoes, the other being Piton des Neiges, that make up Réunion. Up until a few weeks ago, it’s most recent eruption was in 1986. Due to its activity, the hikes circling its peak were closed, but we were still able to get an awesome view of it! Of course, we couldn’t have done any of this without our awesome matching hats! Jerome’s mom outfitted us with matching hats to protect us from the sun. Now that the weekend is over it’s time to get down to business. Monday came bright and early with birds chirping and the smell of science in the air! Like all good scientists we had our ritual morning coffee and then rolled out into the field. Spending the majority of the day sampling we were able to see most of the lagoon in Saint-Gilles. 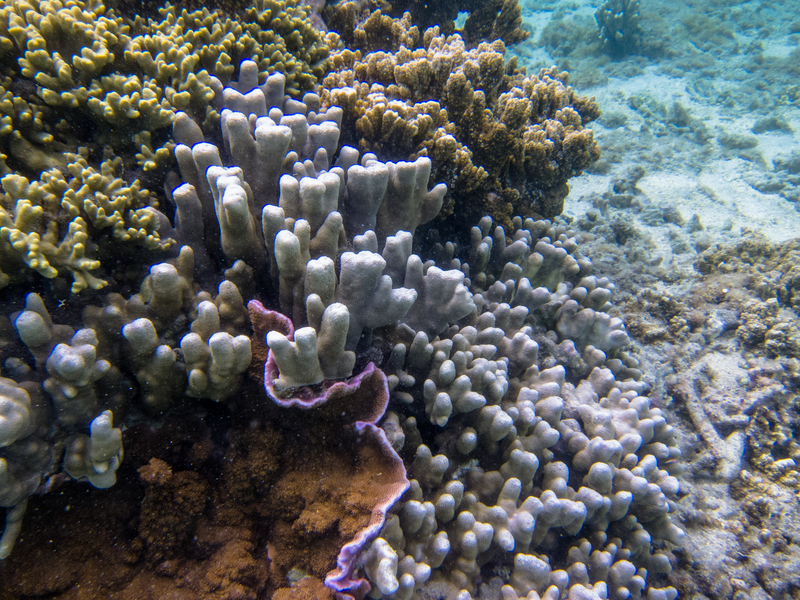 In the lagoon alone we were able to find five different clades of coral, a plethora of sea cucumbers and zero sharks. The main thing that I have to say about Monday is this: weight belts. Even though we were in a shallow lagoon our buoyant weight kept on pushing us up, making it difficult – but not impossible – to sample. From shore I’m sure we looked like two poorly coordinated synchronized swimmers with our feet flapping in the air as we tried to stay down. Today, we hopped in the car and went to a different section of the island in hopes of finding a more biodiverse reef. We struck gold and were met by beautiful reefs in crystal clear water. But there was one catch: strong currents (everyone’s favorite). The currents quickly introduced Ryan and I to the fire corals in the surrounding area and by the end of the field day I’d say we all became good friends. And so folks, that concludes the past few days in Réunion! This entry was posted in GCMP Update, Guest post, Science, Travel by fosteram. Bookmark the permalink.